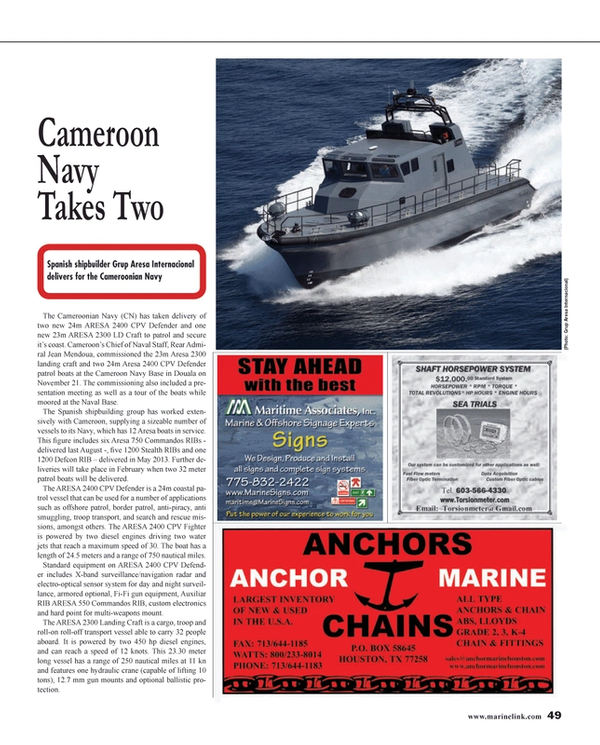 The Cameroonian Navy (CN) has taken delivery of two new 24m ARESA 2400 CPV Defender and one new 23m ARESA 2300 LD Craft to patrol and secure it’s coast. Cameroon’s Chief of Naval Staff, Rear Admiral Jean Mendoua, commissioned the 23m Aresa 2300 landing craft and two 24m Aresa 2400 CPV Defender patrol boats at the Cameroon Navy Base in Douala on November 21. The commissioning also included a presentation meeting as well as a tour of the boats while moored at the Naval Base. The Spanish shipbuilding group has worked extensively with Cameroon, supplying a sizeable number of vessels to its Navy, which has 12 Aresa boats in service. This figure includes six Aresa 750 Commandos RIBs - delivered last August -, five 1200 Stealth RIBs and one 1200 Defcon RIB – delivered in May 2013. Further deliveries will take place in February when two 32 meter patrol boats will be delivered. The ARESA 2400 CPV Defender is a 24m coastal patrol vessel that can be used for a number of applications such as offshore patrol, border patrol, anti-piracy, anti smuggling, troop transport, and search and rescue missions, amongst others. The ARESA 2400 CPV Fighter is powered by two diesel engines driving two water jets that reach a maximum speed of 30. The boat has a length of 24.5 meters and a range of 750 nautical miles. Standard equipment on ARESA 2400 CPV Defender includes X-band surveillance/navigation radar and electro-optical sensor system for day and night surveillance, armored optional, Fi-Fi gun equipment, Auxiliar RIB ARESA 550 Commandos RIB, custom electronics and hard point for multi-weapons mount. The ARESA 2300 Landing Craft is a cargo, troop and roll-on roll-off transport vessel able to carry 32 people aboard. It is powered by two 450 hp diesel engines, and can reach a speed of 12 knots. This 23.30 meter long vessel has a range of 250 nautical miles at 11 kn and features one hydraulic crane (capable of lifting 10 tons), 12.7 mm gun mounts and optional ballistic protection.